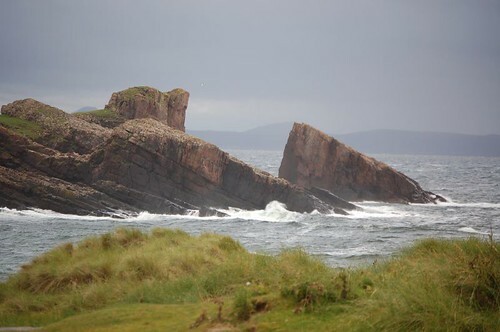 Clashnessie to Clachtoll. 12 Miles. I started this walk from the lovely little beach at Clashnessie. Behind the beach a house which looked as if it had been a croft was being extended and renovated. The view from the front was of a sandy beach, and the back of the house looked onto a beautiful waterfall. Along the side of the house ran a stream that led down to the beach. I thought to myself that this surely had to be one of the most idillyic spots to build a house. But then I have said this so often on this trip. The first place that I saw that made me think was on the Fife Coastal path over two years ago. I realise now that being on the move allows me to own everything and nothing. As I set off around the small peninsula of Stoer Point I soon met a bullock that was stood in the middle of the road bellowing at it’s reflection in the window of a half- built house. I realised that I would have to actually push the thing out the road to get past it, and so like the brave man I was, I immediately turned around and walked an extra couple of miles to avoid it. I’m never sure about bulls, never mind cows, perhaps some knowledgeable stockman can inform me on the correct mode of behaviour regarding these animals. Until I feel comfortable that I have an inkling as to what to do Im not taking any chances. The walk from Culkein towards Loch Cul Fraioch was a bit boggy but looking back from the Aeriel mast at the hills was a great sight. I walked down the hill to the lighthouse at Stoer. Only a few days before. someone unfortunately got swept out to see and drowned from this point. Later when I reached Lochinver there was signs in the post office for the man’s funeral service. The walk back towards the “main road” led me through the scattered houses of Balchladich and down into Clachtoll, which is really just a camp site on the beach. You are currently browsing the Scottish Coastal Walk blog archives for the day Monday, August 13th, 2007.